Andrew Coulson has published a new paper on State Education Trends. Here is a quote and graph from the paper. I guess this is not surprising but it begs the question whether common core is the answer. 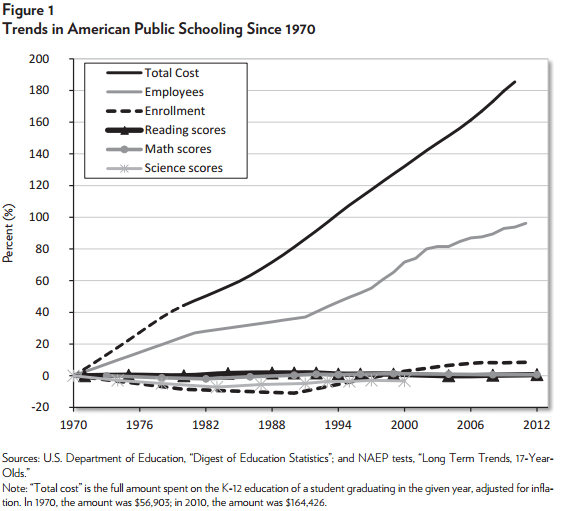 The performance of 17-year olds has been essentially stagnant across all subjects despite a near tripling of the inflation adjusted cost of putting a child through the K-12 system. ← How Do You Tell healthcare.gov You Don’t Love Them Anymore?